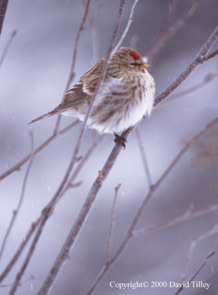 Photography of Wildlife & Natural Areas of Newfoundland; Common Redpoll ( Carduelis flammea ). This tame cousin to the pine sisken is a frequent visitor in winter. Gathering in large flocks and raiding feeders when threatened by stormy weather. Most commonly found in the North Shore Forest region.